Twitter released its staff diversity numbers to the public Wednesday, but before you go lauding the company for such transparency, it’s worth noting Twitter didn’t act of its own accord. It caved to pressure from Reverend Jesse Jackson and activist organizations ColorofChange and the Rainbow PUSH Coalition. Furthermore, it’s one of the last consumer web companies to publish its diversity numbers, given that Facebook, Google, Yahoo, and LinkedIn released theirs in the past month. Twitter also picked a particularly opportune time to publish the unflattering information: During Facebook’s second quarter earnings release. With the eyes of the internet turned towards its biggest rival, perhaps Twitter was hoping to bury its dirty diversity laundry. The numbers, although unsurprising, are staggering. They show the company is largely made up of white men, with the second largest ethnicity — Asian — representing 29 percent. But black, Native American, Latino, and Pacific Islander races are woefully underrepresented, making up less than 12 percent of the company collectively. 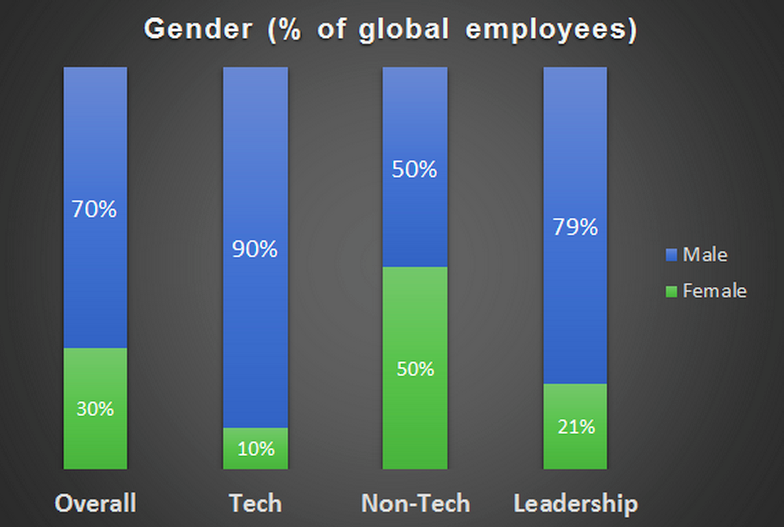 The male to female ratio was equally atrocious, with only 30 percent of Twitter’s employees women. “[L]ike our peers, we have a lot of work to do,” Twitter’s VP of Diversity said in the blog post. Perhaps the company could start by cutting the sneakiness when confessing its failures to the public. Big events (good and bad) keep happening all the time. While Twitter’s employee diversity might not be something to take a lot of pride in (but hey, they are a company, not the UNO! ), I wouldn’t accuse them of trying to sweep this down the FB announcement carpet. And even if they did try, would they be so naive in believing that the world wouldn’t notice it? I’m ALL for diversity in the workplace, but find this article seriously lacking in quality. If I were you, I would have done some research on the number of non-white CS graduates coming out of recognized/respected schools, and done statistical analysis based on that data. Hey @ArunIyer, you make a good point about the diversity of CS graduates limiting Twitter’s ability to hire developers from a range of backgrounds. But outside of that, Twitter doesn’t have much of an excuse for the fact that the majority of the company’s non-tech and leadership staff — who don’t necessarily need to be CS grads — are homogenous, mostly white and Asian. A great successful and global company hires the best and most productive people . Its only in mongrel and racist America where ethnicity an an issue. and trumps” best and most productive qualities” That is pathetic and a recipe for mediocrity, across the country. Should we hire the right person for the job, or should we strive to make some socially acceptable quota? The baiting in this article is beneath the standards I’ve come to accept from GigaOM. Way to COMPLETELY fail to understand how diversity works. No one hires the wrong person for a job because they need to fulfill a quota. Instead, they hire white men because they are already friends/family with them, and are prejudiced to see them as equal or more qualified in the absence of any facts to support that idea. Considering that there are more women in college now than men, what excuse is there to have such a gender bias? And if this occurs with gender, isn’t it likely it might also occur with ethnicity? The “right” person? “Socially acceptable” quota? Your thinking–its false parallels, assumed conclusions, and blind ignorance combined with an arrogance of judgement and false equivalency that stereotypes and denies real truth–that many others are qualified and socially not accepted–is exactly why diversity is needed, and tech remains a bastion of overpaid white men. The one time my workplace had something approaching decent diversity, it just so happened that my divisional vice president was African American. It may or may not be true that hiring the top echelon outside your ethnic or social group will help diversify the workplace in general. but at the very least, it would do something about the inbred culture of our corporate hierarchies, which seems to consist of a few socially homogeneous “rockstars” who all hire and overpay each other, while the earning power of everybody who works for them deteriorates, along with the viability of the very enterprises these leaders are supposed to be shepherding. Even if you’re a middle-class white guy who thinks “diversity” is PC nonsense, you should care about the creeping feudalism of your corporate overlords.